Soldiers destroyed illegal opium fields in Doi Ang Khang recently, the fields remote location and proximity to the border have seen it raided regularly for opium cultivation. 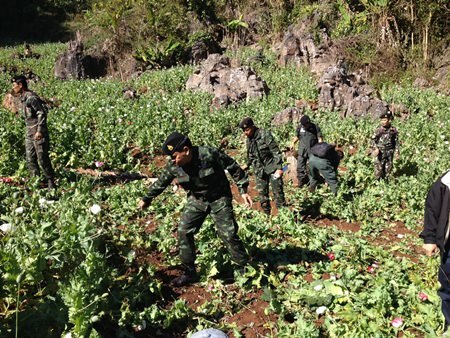 Soldiers and officers from the 3rd Army Region and the 5th Cavalry Regiment Task Force joined officers of the Office of the Narcotics Control Board in destroying opium fields at Sui Tang path in Doi Ang Khang in Fang and Chai Prakan Districts. Sui Tang Path in Doi Ang Khang is set in a high valley with cold weather, fertile soil and is adjacent to the border making it difficult to reach and making it easier to evade detection by authorities. Officials from the Narcotic Crops Survey and Monitoring Institute found illegal opium under cultivation on 12 plots on 29 rai of land. Lt. Gen. KasemThanaporn, 3rd Corps Commander and Deputy Commissioner of National Command Centre for Drugs, said that in 2012/2013 they destroyed 23.55 rai and 10.5 rai in 2013/2014 and 29 rai in 2014/2015 so far. The National Command Centre for Drugs Elimination of the 3rd Army Region surveyed and find out 432.95 rais of opium fields in total of which 432.07rai had already been destroyed. (From left) Wisut Buachoom, Director of the TAT Chiang Mai, Pol. Col. Montree Sambunnanon, Commander of Chiang Mai Provincial Police, Orachorn Chanwiwattana, General Manager of Central Festival Chiang Mai and Vice President of the Chiang Mai PAO Pichet Pisuttakul announce Chiang Mai Countdown 2014 to be held at Central Festival on New Year’s Eve. Chiang Mai Countdown 2015, Sawasdee to the World, will be held at Central Festival on December 31, 2014 from 5 p.m. onwards and will include various activities including booths selling goods and offering games as well as music from popular entertainers like Crescendo, Playground, Season Five, Sixty Miles, followed by a beautiful fireworks show. Pichet Pisuttakul, Vice President of the Chiang Mai Provincial Administration Organization (PAO) was joined by Wisut Buachum, Director of the Tourism Authority of Thailand, Chiang Mai office (TAT), Pol. 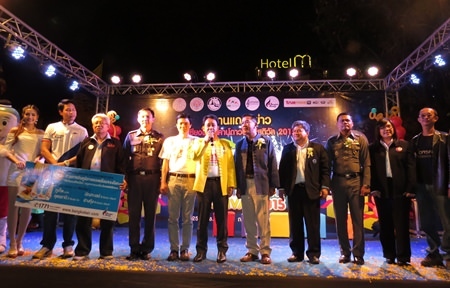 Col. Montree Sambunnanon, Commander of Chiang Mai Provincial Police, and Orachorn Chanwiwattana, General Manager of Central Festival Chiang Mai in announcing the festival on December 21, 2014. The Vice President said the event will bring smiles and happiness to the people of Chiang Mai and tourists both in Thailand and overseas to celebrate the countdown to 2015. This will be the biggest countdown event in Chiang Mai and will promote a positive image of tourism and expressed the readiness of Chiang Mai to accommodate and welcome all tourists. The government announced a plan to distribute 11 million rai of forest land to 450,000 disadvantaged people nationwide. The Minister of Natural Resources and Environment, General Dapong Rattanasuwan said the first phase of the project would begin in February 2015 when 9,000 poor farming families in Chiang Mai, Mukdahan, Nakhon Phanom and Chumpon would receive 53,000 rai of land in national parks and Sor Por Kor 4-01 land, which is reserved for farmers and cannot be bought, sold or used as collateral for a loan but can be left to heirs. The government’s recent survey found that there are around 450,000 landless farmers in the country and the ministry plans on speeding up the survey of land which can be distributed to these farmers. The government believes that more than 80% of them will receive land through this title which will prevent them from selling the land to others but allow them to farm. 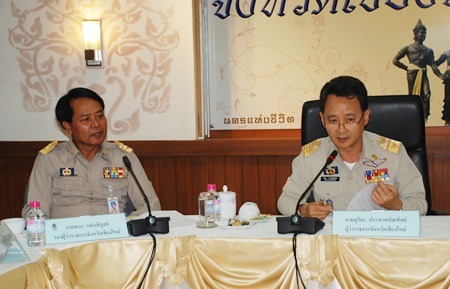 Chiang Mai Governor Suriya Prasatbuntitya chaired the Road Safety Center meeting with related agencies including the police and officials from the Land Transport Office. Governor Suriya Prasatbuntitya chaired the committee meeting for the Road Safety Center at City Hall on December 22, 2014 to discuss measures to reduce traffic accidents during the New Year holiday. The meeting discussed such as issues as road blocks to check for drunk drivers, traffic engineering to reduce traffic jams including the plan to ban buses on Doi Suthep, as well as law enforcement for traffic and the use of bike lanes as alternative transportation by visitors. The government plans on constructing bicycle routes for Doi Inthanon in 2015 as part of their program to promote cycling in Thailand. Other safety measures in addition to alcohol checks include strict enforcement of traffic laws including driving down the wrong side of the road, wearing of helmets on motorcycles and running red lights. The “7 Dangerous Days of New Year” begin on December 26, 2014 and end January 2, 2015. Last year Chiang Mai ranked 2nd for road accidents during the 7 dangerous days of New Year and saw 11 people killed and 119 accidents. Nationwide 366 people were killed and 3,345 people were injured in in 3, 174 accidents during this period. Mr. Akihiko Fujii, Consul-General of Japan in Chiang Mai, and Mr. Jukkapun Klittamanorote, Director of Muangpan Hospital signed the funding contract to purchase a 4 wheel drive ambulance and medical equipment to serve remote mountain villages. The Government of Japan, under its Grant Assistance for Grassroots Human Security Projects Scheme (GGP), is providing funds amounting to 2,655,000 baht for “The Project for Procuring Medical Equipment for Residents in Mountainous Areas in Muangpan District, Lampang Province”. 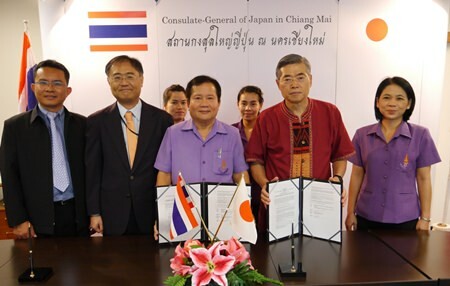 On December 23, 2014, Mr. Akihiko Fujii, Consul-General of Japan in Chiang Mai, and Mr. Jukkapun Klittamanorote, Director of Muangpan Hospital, jointly signed the funding contract at the Consulate-General of Japan in Chiang Mai. Muangpan District is located in a mountainous area in the north of Lampang Province, much of which is designated as national forest or national parkland. Muangpan Hospital, a community hospital serving the entire district, has provided regular mobile clinics for residents in the remote mountain villages who have difficulty visiting the hospital for both geographical and economical reasons. Moreover, since 2003, the hospital has provided a registered nurse from the hospital to each of eight local health centers in the district as well as lending out rehabilitation equipment to one of them. This is a unique effort to increase access to medical services for residents by enhancing the availability of human resources and the equipment at each of the local health centers which are the nearest medical facilities for residents. However, the ambulances that Muangpan Hospital possesses are all 2WD. Thus, procurement of a 4WD ambulance capable of negotiating rough, unpaved roads in the mountainous areas is an urgent issue that needs to be addressed. Some medical equipment also needs to be procured because of a shortage due to the increase in the number of patients and the aging of existing equipment. The number of patients with respiratory diseases in this northern province has risen 5 to 6 times the normal level as freezing temperatures hit the region. Dr Surasing Visaruthat, deputy chief of the Chiang Mai Provincial Pubic Health Office, said today that hospitals in all 25 districts here reported increased numbers of patients suffering from respiratory complaints by 5-6 times. Most patients diagnosed with the diseases were children and elderly, said Dr. Surasing, adding the number of patients was particularly high at hospitals in areas hit by the severe cold. Dr Surasing said he has instructed all hospitals to prepare a sufficient supply of medicine, doctors and nurses to handle the higher number of patients. He also ordered sending public health volunteers to each community to provide knowledge to local villagers on how to better protect themselves against the cold to help reduce the impact of the lowering temperatures. The temperature in the heart of Chiang Mai was recorded at 12.6 degrees Celsius on the morning of December 23, 2014. 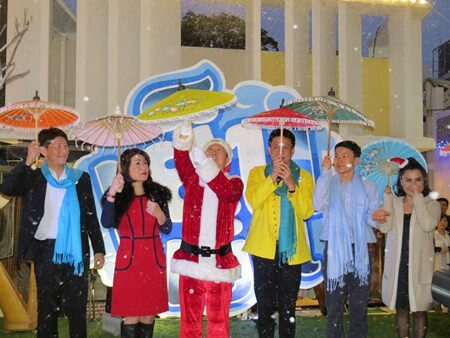 Tan Passakornnatee, the charismatic owner of Think Park, the Eastin Hotel next to it and founder of Oishi Tea, opened the newest attraction at Think Park, the Snow Festival on Friday December 20, 2014. Joining him were Chiang Mai Mayor Tussanai Buranupakorn and other executives of the hotel. 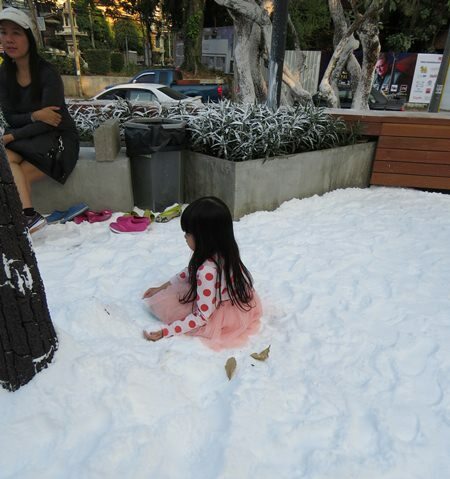 The Snow Festival runs concurrently with a Beer Festival at Eastin Hotel until January 4, 2014. Additionally the festival will offer live jazz music for guests. The Snow Festival has created not only a lot of fun photo ops for locals and tourists and worked as a draw to the shopping area but also a great deal of controversy as residents worried about the effects on the soil, the roads and the sewage systems. In response to social media postings the organizers have added more plastic around the sidewalks and covered them in grass to keep the salt from drifting into the road. According to executives the soil was completely covered by plastic before the tons of pure salt was dumped. Chiang Mai Governor Suriya Prasatbuntitya sent an official to check the site, test the salt and ensure that salt does not enter the sewage system. The official tested the lines and said the amount of salt in the lines was at acceptable levels. Additionally the salt was tested and is pure sodium chloride with no added iodine or other chemical additives so it is safe for children to play in. The controversial Snow Festival has drawn hundreds of locals and tourists to Think Park for the event. Children play in the snow, which according to tests is pure sodium chloride and not harmful to humans. The Commerce Ministry plans on speeding up establishment of the planned special economic zone in Mae Sot, Tak Province Ministry officials recently reported. The government wants to boost trade and investment between Thailand and Myanmar in 2015. The Commerce Ministry visited the border town last week and viewed progress on the project. The zone is expected to be established by the end of January 2015 and plans on establishing a business council to facilitate trade between the two countries. The governments are also working together to construct a route linking Mae Sot to Myawaddy and Kawkarek in Myanmar. The construction is due to be completed by July 2015 and is predicted to boost border trade to more than 100 billion baht, up from the current value of 60 billion baht and boosting Thailand’s export growth to 4%. Police uncovered 1.2 million methamphetamine pills and 30 kilograms of crystal methamphetamine hidden in the car of a Chiang Rai woman. A warrant is out for the arrest of the owner of the car and her husband. Police uncovered a huge stash of drugs hidden in the car of a Chiang Rai woman parked in the parking lot of the Women’s Wing of the Mae Sai Hospital in Chiang Rai. Police had been investigating NatchayananMahattanasittichoke age 24 and herhusband, Nattachai Tanlapan age 47 as being members of the Col. Yi Sae gang of drug traffickers when they discovered Natchayanan’s parked car. 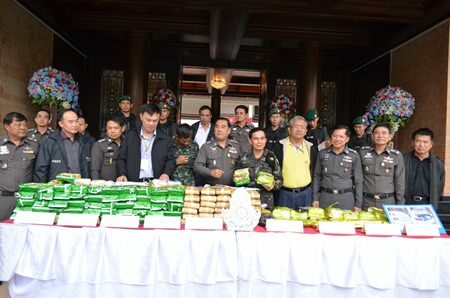 In addition to 1.2 million methamphetamine pills in the car, police found 30 kilograms of crystal methamphetamine or Ya Ice as it is known in Thai. Police had been investigating the couple for acting as distributors for the drug trafficking network. The couple managed to escape detection and a warrant is out for their arrest. Police confiscated a house, car and motorcycle in Chiang Rai belonging to Natchayanan after the discovery as part of the law that allows police to seize property suspected of being obtained due to drug trafficking. The Geminids Meteor Shower on December 14, 2014 at Doi Inthanon by NARIT. The Geminids Meteor Shower filled the skies of the North every year in December, this year from December 4 – 17, 2014.Dr. Saran Poshyachinda, Deputy Director of National Astronomical Research Institute of Thailand (Public Organization) (NARIT) appears nightly at approximately 8 p.m. coming from the northeast, appearing as a white streak across the sky with about 130 meteors an hour, by 9 p..m. the concentration reached 200 per hour. Many people joined at Doi Inthanon to watch the showers. The viewing is part of the project “Open skies to find stars” held in coordination with NARIT and Navaminda Kasatriyadhiraj Royal Air Force Academy to watch the meteor shower. In addition to the watching the meteor shower, NARIT installed more than 10 telescopes in the area for people to observe celestial objects with officials for advice. 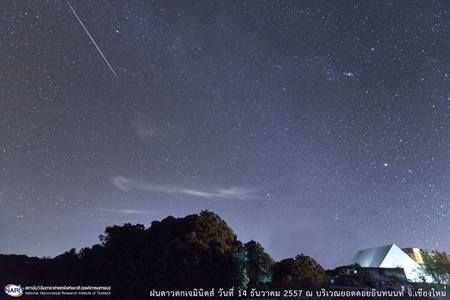 December 14 saw the highest concentrations of shooting stars in the skies over Doi Inthanon. Children with the Kid’s Ark Foundation, a registered non-profit organization that is committed to help disadvantaged children whose lives have been affected by poverty, will receive presents from Santa this year thanks to three Swedish organizations. 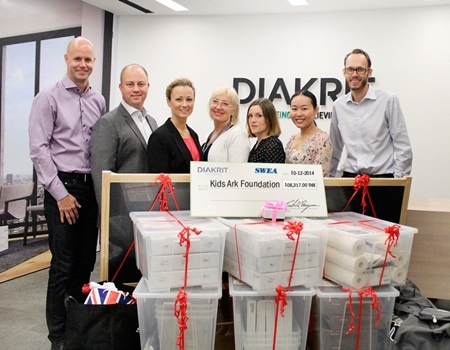 DIAKRIT International Ltd., Swedish Women’s Educational Association (SWEA) and The Milk Project joined forces this year to initiate fundraising for the Kids Ark Foundation (KAF) in Thailand. The companies came together in hopes of helping the KAF to develop their facilities and programs further, thus providing even better care for the children. DIAKRIT placed donation boxes in each of its offices, boxes that the company and its employees used to collect a total of 88,000 baht. The Milk Project raised THB 20,000 thanks to the generous donations of numerous miscellaneous donors. KAF plans on using these funds to buy a large dining table for the children to be able to sit and have dinner together. SWEA chose to donate a wide range of practical Christmas presents valued at THB 30,000. Representatives from SWEA and The Milk Project went to IKEA and purchased the Christmas presents, gifts that which included pens, notebooks, and easels. They also purchased kitchen equipment, Swedish Christmas treats, and a whole lot of toys. Friday’s temperature on Doi Inthanon reached a chilly 3 degrees Celsius and frozen dew was seen on the mountaintop. The Meteorological Office said that temperatures in the city reached 15 degrees with a high of 30. Temperatures are expected to continue to drop a further one or two degrees with lows in the lower parts of the province expected to reach 11 degrees Celsius. Very cold weather and isolated frost is expected on the mountain tops, with minimum temperatures reaching as low as three degrees on the lower mountains. Doi Inthanon is the highest point in Thailand, in Chom Thong District of Chiang Mai and reaches 2,565 meters. Governor Suriya Prasatbuntitya, President of the Provincial Administration Organization Boonlert Buranupakorn, Mayor Tussanai Buranupakorn, the Provincial Public Health Office and Police and sponsors Bangkok Air represented by Passapong Jirawattanasak, Regional and International Corporate Communications Department Manager onstage for the press conference. New festivities at Tha Pae Gate are to be alcohol free it was announced at a press conference held by the government of Chiang Mai, the Municipality and other organizations. Countdown to New Year will be held at Tha Pae Gate from December 25 to December 31, 2014 and will feature concerts by popular singers and performances. The festival will also offer a variety of food and products for sale as well as the ever popular street side massage. Governor Suriya Prasatbuntitya welcomed everyone to the event noting that Chiang Mai is one of the top New Year’s Eve destinations in Thailand. He was joined onstage by President of the Provincial Administration Organization Boonlert Buranupakorn, Mayor Tussanai Buranupakorn, the Provincial Public Health Office and Police as well as sponsors Bangkok Air represented by Passapong Jirawattanasak, Regional and International Corporate Communications Department Manager. The government is working to reduce the number of drunk driving accidents over the New Year period in Chiang Mai and offering a family friendly atmosphere at Tha Pae Gate for visitors and locals. Along with massages there will be food, music and fun. The government of Japan provided funds for Wat Papao to build a school for children of ethnic Shan migrant workers in Chiang Mai. The Government of Japan, under its Grant Assistance for Grassroots Human Security Projects Scheme (GGP), has provided funds amounting to 3,707,000 baht for a project entitled “The Project for Construction of a Schoolhouse for the Myanmar Ethnic Group in Muang District, Chiang Mai Province”. On November 26, 2014, Mr. Akihiko Fujii, Consul-General of Japan in Chiang Mai, and Phra Khru Amornveerakhun, Chairman of the Wat Papao Foundation for Promotion of Education, Art and Culture, Mr. Chumphol Ratolertlop, Director of Chiang Mai Primary Education Service Area Office 1 and Nithithorn Thepthewin, Director of Non-formal and Informal Education Muang district office were present at the project completion ceremony at Wat Papao, Muang district, Chiang Mai. The majority of Shan ethnic people residing in Northern Thailand are displaced persons who fled into Thailand to escape threats of various persecutions in Myanmar. Most of them have been earning their livelihood by working as laborers in the agricultural, construction, manufacturing and service sectors because they are able to communicate in Thai language which belongs to the same language group as Shan. However, they have been under the rough living-working condition. On the other hand, theThai government, with the background of the necessity for countermeasures to combat the serious labor shortage and the need to improvement of Thai - Myanmar relation resulted from the beginning of democratization of Myanmar, has embarked to improve the lives of displaced persons and migrant laborers from Myanmar in the terms of labor, education and welfare. Wat Papao Buddhist temple was established in Chiang Mai city by Shan people about 400 years ago and has performed a central role in maintaining the religion and traditional culture of Shan people in Northern Thailand. 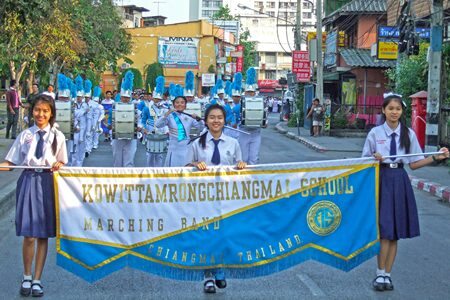 The Wat Papao Foundation for Promotion of Education, Art and Culture was established in 1997. The foundation procured permission from the Ministry of Education and established a primary school (with kindergarten) and a school for adults within the temple ground, has accepted displaced Shan children and adults and tried to preserve the Shan language and traditional culture by using the class schedule of cultural and club activities. Under these circumstances, in response to a request from the foundation, the Government of Japan provided the costs of construction of a new schoolhouse in order to resolve the lack of classrooms for new applicants to enter the school and the construction of the 3 storey schoolhouse has now been completed. It is expected that this project will promote basic education, understanding about the situation in motherland, and empowerment with abilities as citizens of civil society, which will further lead them to play a role of community development leaders after their eventual return to homeland, and assist in the stabilization of Myanmar society in the long term. Furthermore, it is also anticipated that this project will lead to build co-existence relationship of Thai - Shan people, stabilization and improvement of the welfare of communities in the city area. Through its Grant Assistance for Human Security Projects scheme (GGP), the Japanese government intends to continue to support projects which contribute to Human Security including assistance to improve the welfare of ethnic nationalities from Myanmar. Worrawit Intajai, Head of the Emergency Relief of Disaster Prevention and Mitigation Chiang Mai Provincial office announced that ten districts have been declared disaster areas by the Governor. Chiang Mai Governor Suriya Prasatbuntitya declared ten districts in Chiang Mai Province as disaster areas due to cold weather as temperatures in the mountains continue to drop. 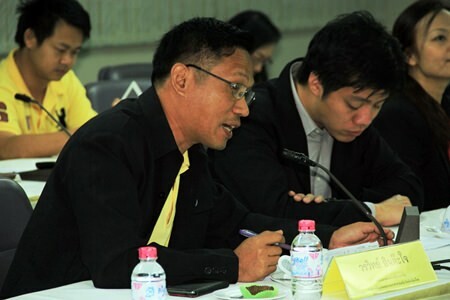 Worrawit Intajai, Head of the Emergency Relief of Disaster Prevention and Mitigation Chiang Mai Provincial office said that the Meteorological Department has forecast a high pressure area from China extend covering Northern Thailand, which makes temperatures drop. Remote mountain areas have seen lows of around 15 degrees Celsius over a period of 3 consecutive days, affecting 281,259 victims, 89,336 households, 466 villages, 43 subdistricts, in 10 districts. The ten districs are; Galyani Vadhana, Om Koi, Wiang Haeng, Mae Chaem, Fang, Chai Prakan, Samoeng, Mae Taeng and Muang districts. In addition to assistance from the local government companies have offered assistance including Honda Fund Thailand, Thai Nakorn Patana Company Limited and Spring News extend to various area such as Doi Tao, Om Koi, Chom Thong, Mae Chaem Doi Saket, Hot and Mae On donating 13,000 blankets and overcoats to victims. Those who are neediest are elderly, poor children, and the disabled need 254,490 blankets, 22,624 wool blankets, 50,783 sweaters, 3,995 other clothes. However, members of the private sector expressed a desire to donate sweaters through the Governor. More disaster areas are expected to be declared if the temperatures continue to drop. The Chiang Mai Night Safari shows off the new baby albino wallaby. The newest member of the Chiang Mai Night Safari was announced by Dr. Sarawut Srisakun, Acting Director of the Pinkanakorn Development Agency (Public Organization), a baby albino wallaby. The new baby was released into the display area on December 15, 2014. Wallabies are a member of the kangaroo family but are smaller in size and native of Australia. Full grown wallabies are about 1 meter tall and weigh between 11 – 26 kilograms. The tail of the wallaby is long and strong and used for balancing and jumping. 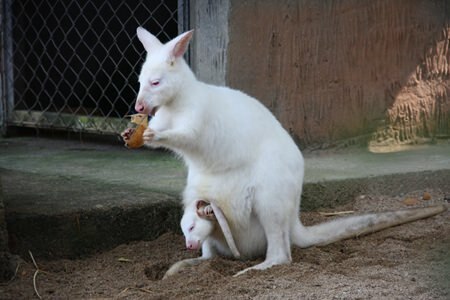 The albinism in the baby wallaby is caused by disorders of the blood cells and may shorten the life of the baby. Knowing about the risks of human trafficking is not stopping an estimated 3 to 5 million people from Laos, Cambodia, Myanmar and Vietnam from migrating for work in richer neighbouring countries, a new research study has found. The lure of earning enough money to send back to their families often overrides known risks or actual previous experiences of exploitation, dangerous working conditions or excessive hours, revealed the World Vision research being launched days before International Migration Day on 18 December. “This is the first time we can confirm, with empirical evidence, that prevention work relying on raising awareness is not enough. Young people will continue to migrate. It’s time trafficking prevention agencies shift the focus of prevention work to safe migration,” said John Whan Yoon, World Vision’s End Trafficking in Persons Regional Programme Manager. “Raising awareness on the risks of migration needs to focus on changing risky behaviour to protective behaviours, such as travelling with formal documents and keeping in regular contact with family members,” Whan Yoon added. The Vulnerability Report: Human Trafficking in the Greater Mekong Sub-region, a first of its kind regional study supported by a leading UK research university, draws on responses from close to 10,000 children, young people and adults in communities across Cambodia, Laos, Myanmar, Thailand and Vietnam. The report further found that young people who knew how to protect themselves were more likely to have a job with good working conditions and earn enough money to send home. “We are not advocating for young people to move beyond their borders for work. However, we are seeking to empower youth with protective behaviours that could keep them safe in case they decide to work in another country,” Whan Yoon said. Across Vietnam, Laos, Thailand, Cambodia, China and Myanmar, World Vision works with young people children and youth clubs where they learn about safe migration and how to protect themselves from the risks of exploitation and from being trafficked. The report’s release also coincides with an art and multimedia exhibition at the Bangkok Arts & Culture Centre from 16-21 December entitled "Journey of Voices" –hosted by World Vision and the International Labour Organisation as part of the inter-agency Saphan Siang campaign – to bring attention to the realities of the migrant labour experience in the region. 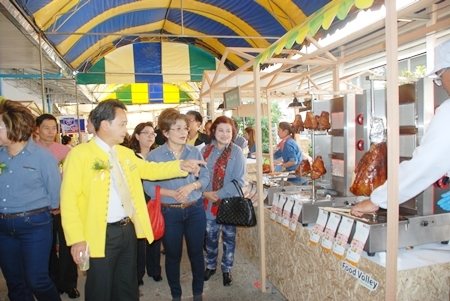 The Rimping Supermarket brand continues to expand after renovations on the Kad Farang branch in Hang Dong Sub-district opened to great fanfare and many excited area residents on Sunday, December 14, 2014. The new Rimping branch brings the locally owned supermarket chain to a total of nine branches including smaller Express type branches. 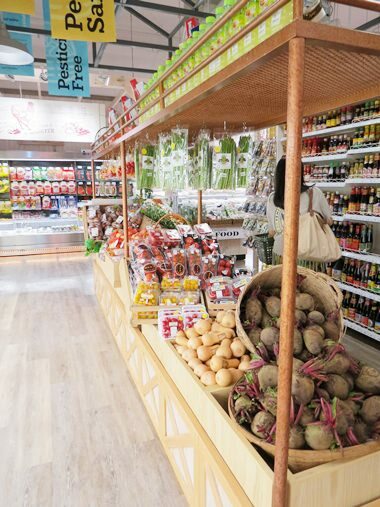 The original store was a mom and pop grocery store started over 60 years ago and has grown into a full service western style supermarket specializing in organic and safe foods. PTT Public Co. Ltd. and Bangchak Petroleum Public Co. Ltd both announced plans to lower prices at the pump beginning December 16, 2014. The companies will lower prices across the board, including benzene, gasohol and diesel. Benzene and gasohol will both see price drops of 2 baht per liter, although E85 will only be lowered 20 satang per liter. Diesel will be lowered by 1 baht per liter. Prices for Benzene 95 stand at 37.36 baht per liter, Gasohol 95 at 30.30 baht per liter, Gasohol 91 at 28.28 baht per liter, E85 at 22.48 baht per liter and Diesel at 26.89 baht per liter. The companies have lowered fuel prices in reaction to lower costs of oil, as the benchmark price for U.S. oil dropped 48% in the past six months. CEO of the Bangchak Petroleum Public Company Limited, Wichien Ussanachote reported that he believes the price of crude oil per barrel in Dubai would continue to drop in 2015. He noted that major oil producers in the Middle East, West Africa and Atlantic have not lowered production and a strong dollar would bring down prices. The Chiang Mai Japanese Association donated funds to the Provincial Red Cross on December 11, 2014 to help needy Chiang Mai residents. A representative of the Chiang Mai Japanese Association was joined by Japanese Consul-General Akihiko Fujii at the donation ceremony which saw the group hand over 80,762 baht to the President of the Chiang Mai Red Cross Mananya Prasatbuntitya who received the donation on behalf of the Red Cross. The funds were raised by the Chiang Mai Japanese Association from a Charity Bazaar event and the Thai-Japan Golf Friendship tournament. 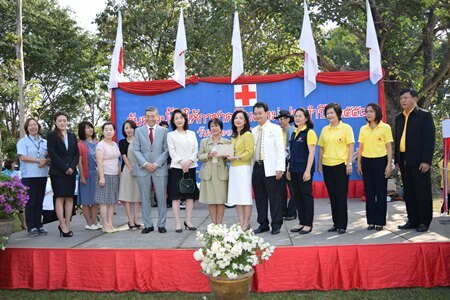 Chiang Mai Governor Prasatbuntitya and Mananya Prasatbuntitya, as President of the Chiang Mai Provincial Red Cross received donations for the Red Cross Winter Fair on December 11, 2014. The annual fair is a popular event in Chiang Mai featuring fun rides, games, raffles, and prizes. The Red Cross Winter Fair also sees Miss Chiang Mai chosen to represent the city in the Miss Thailand contest. The first Winter Fair was held at Yupparaj Wittayalai School in 1936 before being moved to the Municipal Stadium in 1954 and finally to the vacant land behind City Hall. The event is being held from December 26, 2014 to January 4, 2015. Noppadon Pakprot, Executive Director of Events for the Tourism Authority of Thailand, Deputy Governor Supachai Iamsuwan, and Assistant Professor Suphachai Chuaratanaphong, M.D., Vice President for University Council Affairs and Vilawan Svetsreni, Director of Center for the Promotion of Arts and Culture are joined on stage for the grand opening ceremony by visiting and local puppets, puppeteers, and honored guests. The International Puppet Festival is being held at the Lanna Traditional House Museum on Canal Road from December 12 – 14, 2014 and features puppeteers and unique puppets from 10 countries, ASEAN countries and three others. 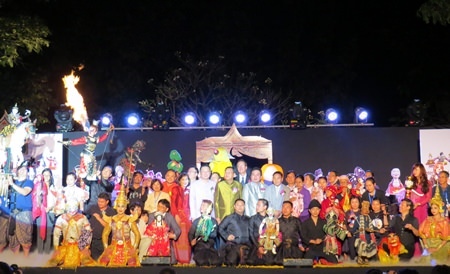 “The International Puppet Festival ties the countries of ASEAN and two other countries through the unique form of puppetry,” said Vilawan Svetsreni, Director of Center for the Promotion of Arts and Culture at the opening ceremony held on Friday, December 12, 2014. 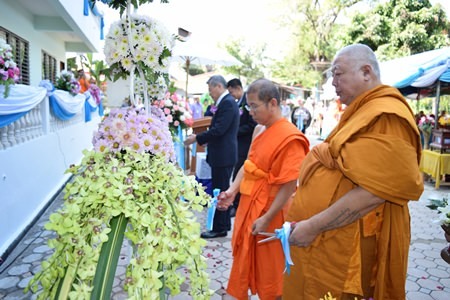 She was joined in the grand opening by Noppadon Pakprot, Executive Director of Events for the Tourism Authority of Thailand, Deputy Governor Supachai Iamsuwan, and Assistant Professor Suphachai Chuaratanaphong, M.D., Vice President for University Council Affairs. Dr. Suphachai Chuaratnaphong said that the event brings a better understanding of each other’s cultures through art, while the Deputy Governor emphasized the importance of close ties of ASEAN countries and the continued exchange of art and culture as we head to the ASEAN Economic Community. Hanuman’s cheeky ways kept the children entertained at the opening night’s show. The International Puppet Festival features puppets from Japan, China, Philippines, Laos PDR, Indonesia, Vietnam, Myanmar, Singapore and others. The unique Vietnamese Water Puppets along with traditional Central Royal puppets, Shadow puppets from Southern Thailand and Indonesia, Chinese hand puppets and string puppets are just some of the many elaborate puppets performing every evening. Additionally workshops are being held daily as well as lovely handcrafted items such as phasin, bags, clothes and toys. Workshops are held daily from 9:30 a.m. to 4 p.m. and puppet performances from 3 p.m. to 6:30 p.m. and in the large venue from 6 p.m. to 9:30 p.m. at the Traditional Lanna House Museum at the corner of Canal and Suthep Roads. The Consul General of Japan signs the funding contract with Kasem Tre-intong, Director of Chalermprakiet 48 Pansa School, Lamphun so that the school can have an adequate supply of drinking water. The Government of Japan, under its Grant Assistance for Grassroots Human Security Projects Scheme (GGP), is providing funds amounting to 3,144,000 baht for “the Project for Improvement of Groundwater Supply System at Chalermprakiet 48 Pansa School, Muang District, Lamphun Province”. On December 9, 2014, Mr. Akihiko Fujii, Consul-General of Japan in Chiang Mai, and Mr. Kasem Tre-intong, Director of Chalermprakiet 48 Pansa School, jointly signed the funding contract at the Consulate-General of Japan in Chiang Mai. Chalermprakiet 48 Pansa School is a private lower and upper secondary girls' boarding school, licensed as a welfare school by the Ministry of Education. The school provides free education and board for 350 disadvantaged students such as AIDS orphans and children from mountainous areas at risk of human trafficking. The school not only provides a formal curriculum for them, but also provides optional vocational training programs to prepare those who have difficulty accessing higher education so that they can be financially independent. As the public water supply system has not yet reached Tonthong Sub-District, where the school is located, the school set up a groundwater supply system on their premises ten years ago in order to provide water for their students. However, the water did not meet the quality standard for daily use, nor did it meet the criterion for drinking water even after treatment by a water purifier. There has therefore been concern over its effect on the health of students. Moreover, the inadequate volume of water supplied by the current system has been an inconvenience to the students' daily life.